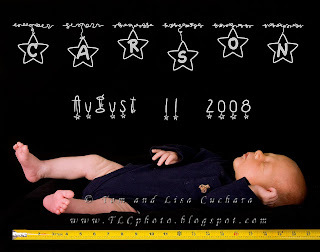 We photographed Carson at 19 days old -- so cute and little and wrinkly -- such a handsome and good baby! 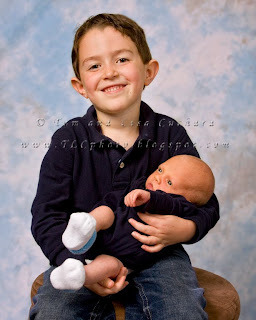 Remember that for 2008 sessions with NEWBORN BABIES (under 3 weeks of age) are complimentary. 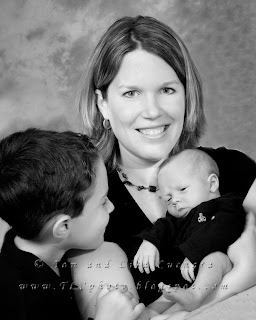 Carson and his parents and his big brother Zack were a delight ot work with. We took a ton of photographs -- here is a sneak peak at a few of them. Stay tuned for more photos later -- we have photos of the four of them, photos of the Mom and Dad and baby, baby with his big brother, photos of mom alone with baby Carson, Dad alone with baby Carson and of course lots of little Carson alone. 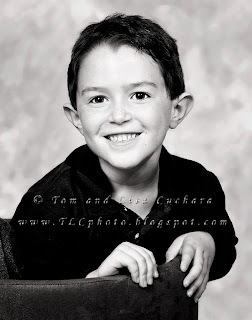 Zack just came ALIVE in front of the camera! 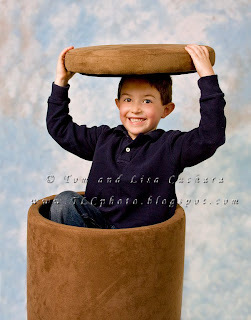 This was our storage ottoman posing stool -- he discovered that it had a lid and room for storage inside -- and he climbed in! 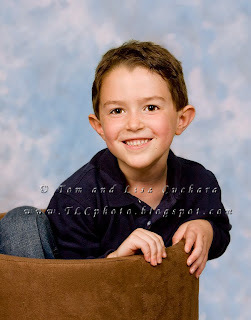 I would love to have Zack back from some GREEN SCREEN fun because he is so anmiated in front opf the camera. 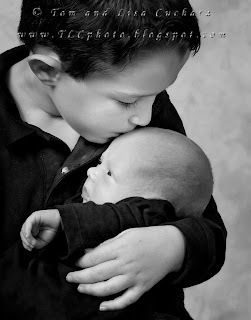 Zack likes being a big brother and seemed very protective (and very comfortable) holding little carson. Without being asked to he leaned over and kissed him on the forehead -- this is just precious! Dad's thumb against little Carson's foot. Hard to believe that in no time he will be asking for new sneakers for little league -- and then using these same feet to drive Dad's car. They grow up sooo fast! This image wasn't even posed, just Dad sitting there with Carson while Mom and Zack went and warmed his bottle.